Male Common throughout the British Isles in most types of wetland habitat. 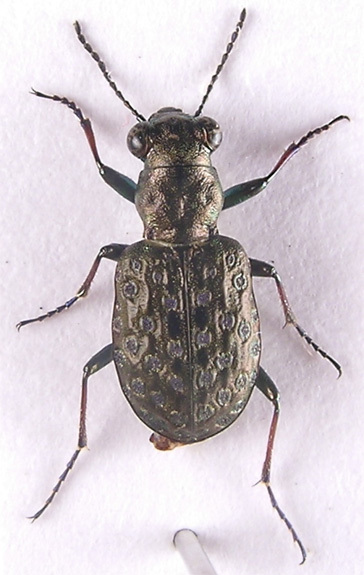 Although E.riparius Lin. 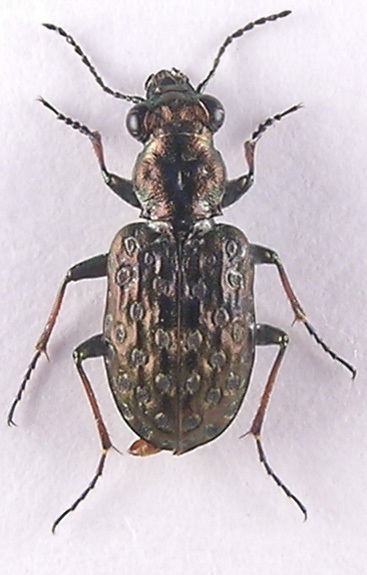 is quoted as the most common species in Lindroth this is not the case around Watford; we have found E.cupreus throughout our area and usually commonly so in all types of wetland habitats, including in company with E. riparius on Common moor. During April 2007 both sexes were common on the southern part of Common moor on open unvegetated and waterlogged soil more than a hundred metres from the river, the weather was unusually hot and, curiously, on this visit the species was not found along the river bank. They are known to fly readily ¹. 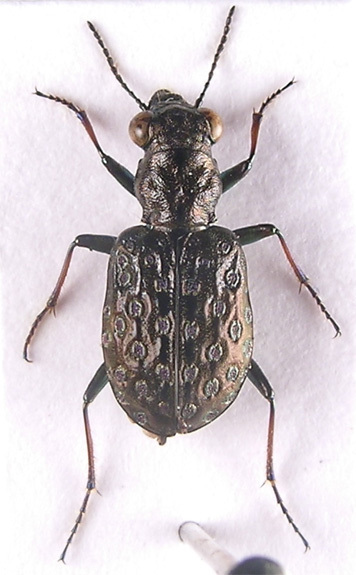 They are sometimes found in small numbers or pairs but more often than not in colonies, usually in company with other carabids and stenus spp. The hottest weather will bring them out onto bare soil but otherwise they are to be found below usually dense vegetation. Although striking as set specimens they need to be seen in their natural habitat to appreciate how cryptic they can be, their habit of moving very fast and suddenly stopping by a plant stem or piece of debris is a very effective escape routine. 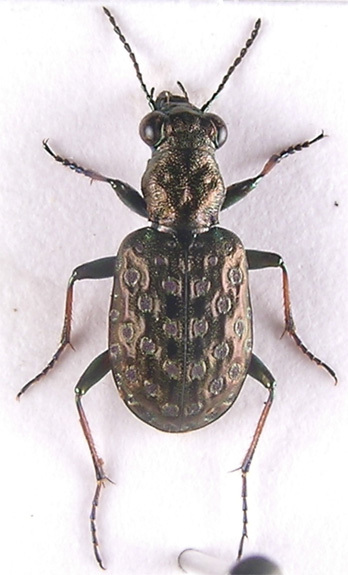 Summer pitfalling will produce both larvae and adults. 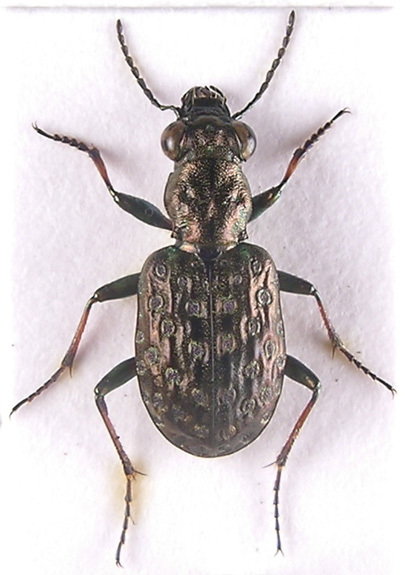 Larger and darker than E. riparius, usually appearing somewhat violet in sunlight rather than green as riparius, both species are soon recognised by naked eye in the field. At least 8 mm. 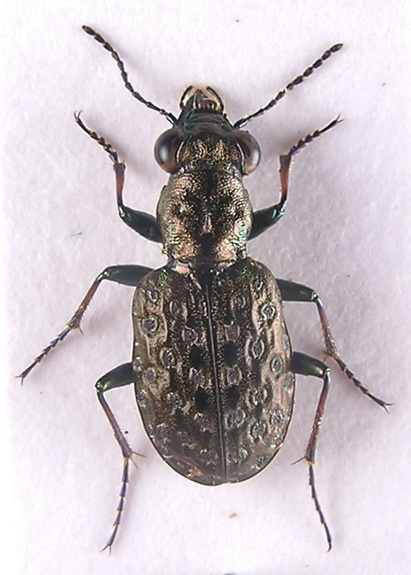 Head with eyes wider than pronotum, labrum and mandibles prominent, antennae dark with 3 or 4 basal segments metallic, usually green. Pronotum quadrate or nearly so with deep median furrow. Entire upper surface dark, almost black, metallic and very strongly sculptered. Each elytron with three rows of very shiny raised fascia although those lateral and apical are somewhat fused. 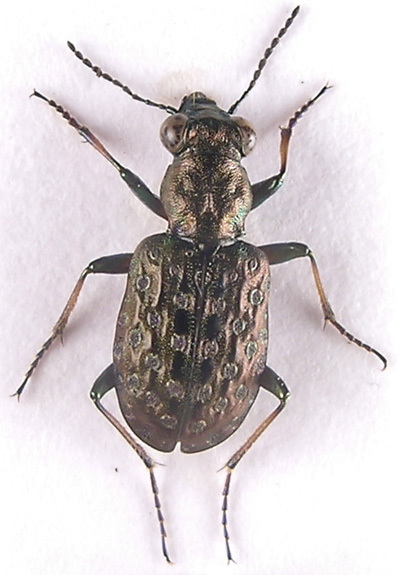 Legs long, femora, tarsi and extremities of tibiae metallic green (cf. E.riparius) but the colour may (rarely) be darkened to the point of being ambiguous. Prosternum glabrous although the prosternal process may have a few long hairs, a condition also seen in E. uliginosus ² but here the tibiae are entirely dark and metallic, and the head is not broader than the pronotum.